Today, Edinburgh becomes a Veg City, kicking off a city-wide campaign to promote vegetable consumption. 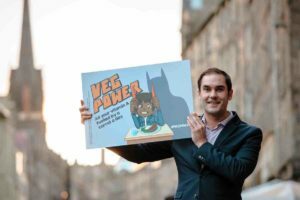 The Veg City campaign start coincides with the launch of a new Veg Power advertising campaign, airing for the first time on ITV and STV tonight. Starting today, schools, community groups, businesses, and families across Edinburgh will join UK-wide activities around the new Veg Power advert. All P4 – 7’s in Edinburgh schools will have a chance to take part in fun veg-themed activities over the course of the next two months, thanks to support from Veg Power, Mash Direct and City of Edinburgh Council. Local businesses will also be invited to join the veg campaign by displaying Veg Power posters in their windows and by making pledges for how they will make veg an easier and more attractive option to their customers. This new campaign will be run by members of the Edible Edinburgh partnership, including the City of Edinburgh Council, NHS Lothian, Scotland Food & Drink, Nourish Scotland, as well as local businesses and community groups. Edinburgh is the third national capital to join the UK-wide network of Veg Cities, alongside Cardiff and London, and third Scottish city, following Glasgow and Aberdeen. 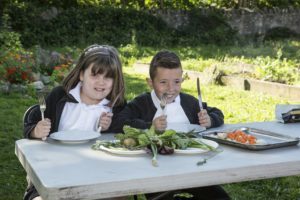 Only 15% of Scottish children and young teens eat the recommended 5 portions of fruit and veg a day. Adults are doing a little better, but the 24% managing 5-a-day are still a small minority. Diets that are low in vegetables are associated with higher risk for many chronic diseases, including type 2 diabetes, cardiovascular disease, certain cancers, and coronary heart disease. The Veg Power and ITV advert will be launched exclusively during the advertising breaks of Coronation Street from 7.30pm on STV on Friday 25th January and The Voice from 8pm on STV on Saturday 26th January.